The U.S. Attorney’s Office for New York’s southern district, which had been heading the Federal investigation into the physical conditions standards and the lead paint poisoning crisis at the municipal housing authority, has engaged in opaque actions about the future of public housing in New York City, in violation of prior criticisms about the lack of Government transparency. By devising an opaque approach to determine the future of public assets that will keep the public in the dark, Federal prosecutors are denying tenants and taxpayers any participation in the governance of the New York City Housing Authority, or NYCHA. 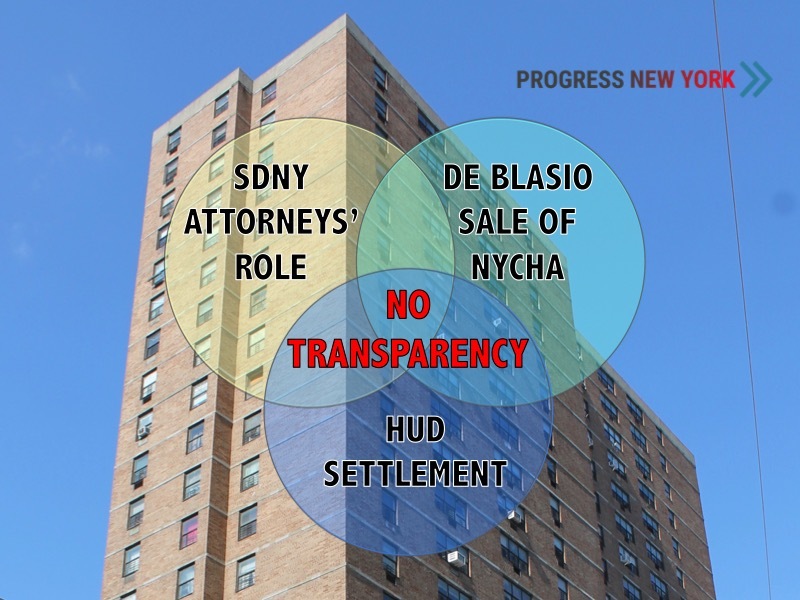 The lack of basic elements of transparency, from the selection of NYCHA leadership to the disposition of public assets, lays the groundwork for possible corruption, say some Government reform activists. In the past, the Nation’s top Federal prosecutor in New York has been critical of the ability of New York Government to operate without transparency. Moreover, the selection of Bart Schwartz as NYCHA’s outside monitor entrusts the role of oversight to an executive, who has reportedly exploited the revolving door in politics for private profit and has reportedly received warnings to back off an active corruption investigation. Thanks to the U.S. Attorney’s Office, NYCHA now receives less scrutiny after U.S. District Court Judge William Pauley III was removed as administrator over NYCHA when Federal prosecutors unilaterally withdrew their Complaint from the District Court. Prosecutors are trusting former targets of corruption investigations to sell public housing assets and to determine leadership and direction of NYCHA. As the top executive of the Government of the City of New York, Mayor Bill de Blasio (D-New York) selects the chief executive officer at NYCHA, and he appoints its Board of Directors, with the power to designate one of its Board members as the Board chair. Presently, the Board is short three members. In the face of little to no oversight, Mayor de Blasio has increased the the amount he plans to raise by selling public housing assets — from $15 billion to $24 billion, even though NYCHA’s properties are not well-maintained. The private disposition of such assets — from public housing apartments, city real property, gardens, playgrounds, green spaces, parking lots, and air rights — has already begun without being subjected to the Uniform Land Use Review Procedure, or the ULURP process, as required by Section 197-c of the City Charter, according to a lawyer with expertise in City legislation. Because of the lack of transparency, sales of public housing and the selection of leadership and direction of public housing are being vested in Mayor de Blasio and one of his top aides, Emma Wolfe. The same U.S. Attorney’s Office that was investigating NYCHA, closed in 2017 a reported Federal corruption investigation intoMayor de Blasio’s political and campaign fundraising practises. The fundraising for political and campaign committees under reported investigation involved donors from the real estate industry. Ms. Wolfe is reportedly influencing the selection of NYCHA’s next chief executive officer. Five years ago, Ms. Wolfe was a person of interest in an independent counsel investigation into the campaign finance activities of the Working Families Party. Up to 600,000 individuals reportedly live in NYCHA public housing apartments. Their future tenancy is at risk over the controversial program known as Rental Assistance Demonstration, or RAD, which has led to tenant harassment and evictions in Maryland and Virginia. Mayor de Blasio’s use of RAD to underpin his recovery plan for NYCHA is deliberately forsaking any democratic approval by public housing residents. For this report, the press office supporting U.S. Attorney Geoffrey Berman refused to answer several questions submitted in advance. In respect of alleged efforts by the de Blasio administration to keep secret its plans to sell NYCHA’s real estate in the borough of Manhattan, Nicholas Biase, a spokesperson, expressly declined to comment. In unrelated civil litigation over alleged violations by the U.S. Attorney’s Office of Federal open records laws, Assistant U.S. Attorney Rebecca Tinio admitted in Court filings that the Government does not respect transparency laws, stating that, in the Government’s view, … “[P]ublic disclosure is not always in the public interest.” To wit, Federal prosecutors have refused to explain why they signed a Settlement Agreement with NYCHA that requires the City of New York to provide $1 billion less than the proposed Consent Decree rejected by Judge Pauley as being insufficient. In the face of no Government transparency — not even by prosecutors — around the sale of public housing apartments, public housing tenants face an unknown future, say Government reform activists.